What's the Best Themed Restaurant in Tokyo? Here's a bit of Information about the Buttu Trick bar. Buttu Trick-Bar, Daini Toua Kaikan 3F, 1-21-1 Kabukicho, Shinjuku-ku (00 81 3 5292 2206; www.ug-gu.co.jp). 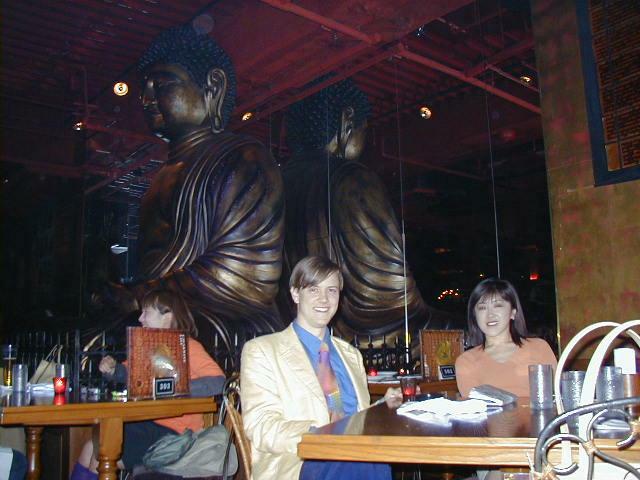 The UG chain's Buddha theme-restaurant offers a seven-course set menu for Y3,000 (£15). The first is when a mini-skirt clad nurse "injects" you up your rear to cleanse you as you enter. After handcuffing you and showing you to your cell (never once straying from character) you have the choice of various 'food' sausages fashioned into a severed male organ, a tofu dish resembling the contents of a deceased inmates stomach and other such delights. The staff will occasionally let out the prisoners who make a hell of a noise while trying to escape past the other inmates. Highlights are the miniskirt police that handcuff you when you arrive and lead you to your table which is basically a cell, cocktails in test tubes and the ecaped prisoners but I won't ruin it for anyone thinking of going! The Lock Up 33-1 Udagawa-cho (just off Center-gai, Shibuya Grand Tokyo Bldg. B2F), 03-5728-7731. Open M-Th 5PM-1AM, F-Sa 5PM-5AM, Su 5AM-12AM. beer \500. After a bit of research came across another religion-themed restaurant; The Christon Cafe where you can eat your dinner in a mock up church with coffin shaped menus . Here's a picture of the decor. There are two "branches" in Shibuya and Shijuku.